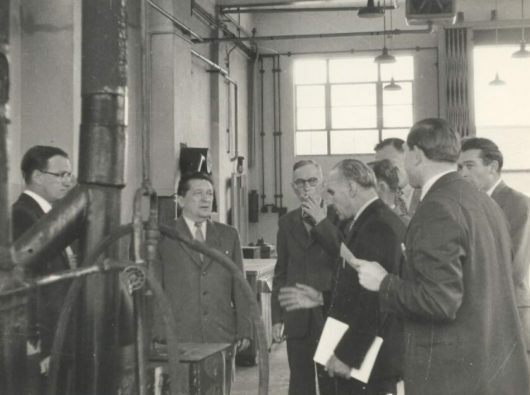 In August 1956 Bord na Móna was involved in a bit of controversy over a two week visit to Ireland by a delegation of Soviet peat experts including the Minister for Peat Stations, Mr Alexei Bausin. The Soviet visit was in response to a trip by Bord na Móna officials to Russia earlier that year. At the time Pope Pius XI warned that no assistance be given to Communism in any enterprise whatever and there was a certain amount of hysteria about the so called Red Menace. Because of that, various Catholic groups were against it and there were lots of letters to the papers denouncing the visit. One of the main protests was the placing of a picket on our head office in Dublin by Firinne, a Dublin Catholic Action Group. The picket carried banners on some of which the slogans were: “Do Reds dominate the Bord?” “Bord na Móna Trademark – Hammer and Sickle” and “Bord Traitors to the Church of Silence.” Leaflets were also given out that asked “What Irish Catholic worthy of the name will not denounce the bureaucratic action of Bord na Móna in bringing to Ireland a delegation of Soviet experts on fuel?” However the visitors were informed that the picket was actually a welcoming committee. In response Bord na Móna pointed out that the visit was a reciprocal one, Irish technicians had previously visited Russian peat installations and that the visiting Russians were engineers. Overall the visit went well and the Russians were impressed with the technical expertise and machine improvements achieved by Bord na Móna since the Second World War. This led to many other visits between both countries over the years and ten years later a delegation of Soviet peat experts were brought to an All-Ireland Hurling Final and not a protestor in sight.